First, clean your fabric using the manufacturer’s recommended cleaning routine (usually listed on the tag attached to the fabric on your furniture). Sometimes, you will be able to use your washing machine to clean removable fabrics. Other styles you may need to scrub by hand with soap before rinsing. To keep everything extra clean, there are also a growing number of patio covers available. You can use these to protect your furniture and fabrics from exposure to sun and rain. However, keep in mind that these too may need some care. 303 can help you there, as well. After you have cleaned your fabric, you may still have stubborn stains that are difficult to remove. Some of the most difficult stains are caused by residue that drops from trees, mildew, and rust. Each type of stain should be treated differently. Tree sap usually does not require a special solvent and can usually be removed with cleaner or other clear oils. Mildew can be more difficult to remove – the most common process is simple elbow grease. Rust is another fabric and metal-damaging culprit. It can create permanent marks on soft fabrics and deteriorate metal. If you cannot take the rust off of your furniture using traditional cleaning methods check online to see what your fabric can sustain before using vinegar to scrub the stain away. Here, we would highly recommend using 303 Multi-Surface Cleaner because it will safely remove all of these stains without harming your fabric and rinses residue-free. 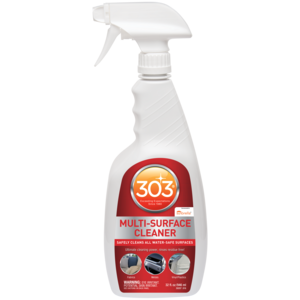 Another great thing about 303® Multi-Surface Cleaner is that it sets you up for taking your fabric protection to the next level: its cleaning ability will allow 303 Fabric Guard to fully bond to the fabric surfaces. 303® Fabric Guard will help you combat dirt, mold, and mildew by restoring your fabrics’ lost stain and water repellency while still keeping those fabrics breathable. Finally, it’s time to protect your outdoor furniture against future stains. If you have any all-weather wicker, powder coated frames, sling back chairs, recycled plastics, resin, or wrought iron surfaces on your patio furniture – you can use 303® Aerospace Protectant to protect them. Using 303 Aerospace Protectant will help prevent any fading, cracking, embrittlement, and chalking. Don’t settle for dirty, dingy patio furniture – protect it and keep it looking like new for years to come with 303 products! I read the above but just to make sure. I have 16 sling chairs.Some one piece rock, some bar stool and some swivel table chairs. All have what I believe is vynal material. I keep them all clean but with time they have faded. Both the sling and powder coated frames. Can you give the names of necessary products to help restore? Hi Norman, 303 Aerospace Protectant can restore the color and luster to your vinyl material. Please contact us at marketing@goldeagle.com if you have any questions about this. Thank you. I was very excited after I used the 303 Protectant on four metal patio chairs. They looked beautiful (like new) for two days. Then it rained. Now they look awful again. What happened. I guess it is only helping with UV protection. What can I use for protection from water? Please know that I did make sure that I thoroughly dried the furniture with the micro-filter cloth.